For many years now, responsable breeders have been selecting out the sharper traits of the 'dobie', and the temperament of Dobermans today is far removed from it's origins. Highly intelligent, curious, loyal and protective, Dobermans still make excellent working dogs, but they can just as easily be great family dogs with the standard caveat of lots of early socialisation. 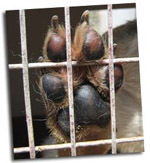 The article on this site - Help, I Have A Bad Puppy! - was actually written by a German Shepherd breeder, but everyhting in that article could as easily relate to Dobie pups. They chew. A lot! Being intelligent, they can be destructive when bored so early training and keeping that little mind occupied are essential. Remember a tired puppy is a good puppy. Despite it's reputation as a guard dog, a Doberman is not really a yard dog. It is sensitive to extremes of cold and heat and as it is very much a people dog, its favourite place in the whole world is going to be inside with you. 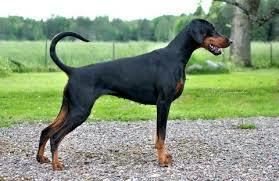 Among other diseases Dobermans are susceptible to Cardiomyopathy, a condition affecting the heart, and Hip Dysplasia. While Hip Dysplasia can be ruled out by genetic screening, no such test exists for Cardiomyopathy though this condition strikes Dobermans more than all other breeds combined. Should you be considering adding a Dobie to your pack you might find the ideal companion at a pure breed Doberman rescue shelter.